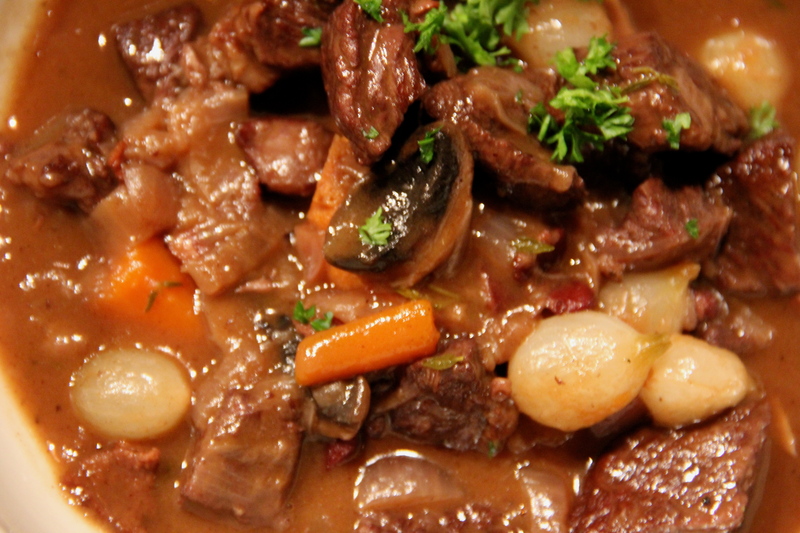 Ever since I saw Julie & Julia, I’ve wanted to make boeuf bourguignon. 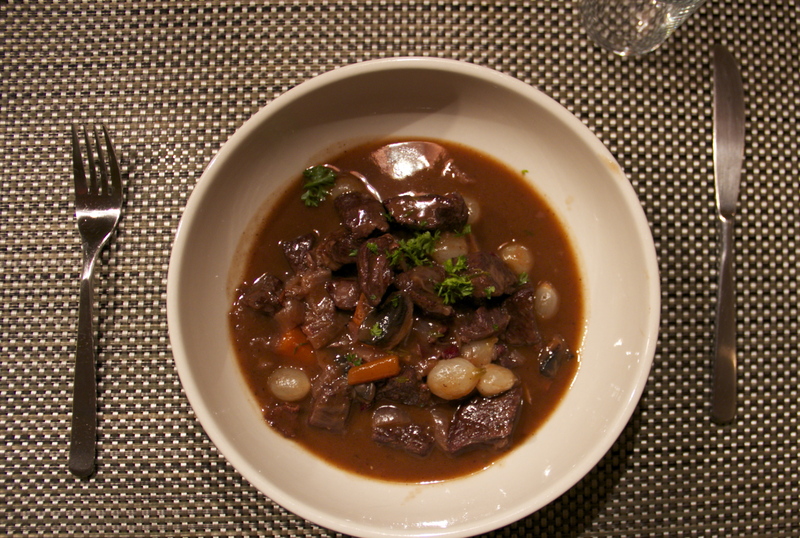 I’ve had it a few times, one time in France cooked by my lovely host mother, but I’ve never made it. 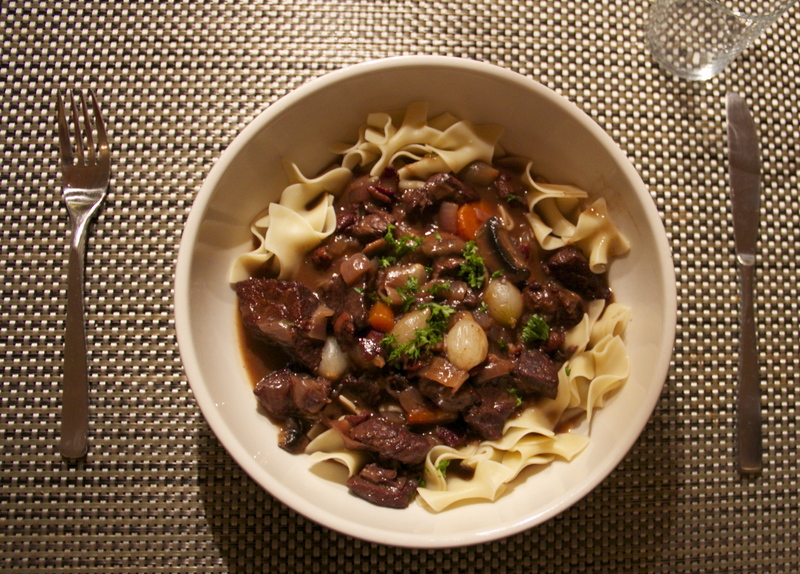 In Julie & Julia, this was a milestone dish of sorts, and I consider it one for me as well. I’ve found that I love more complicated recipes, ones where I have to spend lots of time in the kitchen. I find it much more rewarding. I chose to use Ina Garten’s recipe because it’s a version of Julia Child’s that doesn’t take quite as much time and uses a less expensive cut of beef. Also because Ina is my queen and it’s sometimes difficult for me to accept that there are other people who write cookbooks. I made some egg noodles to go underneath (my family chose this route), but I preferred Ina’s way, with a slice of French bread rubbed with a garlic clove underneath the stew. Delicious. With every new endeavor, I become more and more comfortable with touching raw meat. I was chucking these beef cubes around like nothin’ (note that this is hilarious when you consider the fact I was working with BEEF CHUCK. High-level comedy here). I’m just working through my meat issues one dish at a time. Overall, I loved making this dish a lot. I loved the time it took, I loved the steps involved, I loved the rich, layered end result. I think I’ve all but secured a job at Dallas’ most delicious bakery this summer, which I am extremely thrilled about. If it does work out, I’ll be juggling that with my advertising/graphic design job– my hobbies blending very nicely in order to make me BANK! yummmmm I want it again. so delicious and perfect!!! !